Chocolate Pumpkin Cake: four layers of moist pumpkin cake filled with chocolate caramel cream cheese frosting and chopped dark chocolate. We’re still waiting on getting sneak peeks from our photographer and videographer. In the meantime, I’m reminiscing about the wedding through cake. Unfortunately, none of the guests were able to try the pumpkin tier. The caterers boxed it up immediately after the cake cutting. I love this pumpkin cake recipe. I’ve made it over a dozen times and I have several pumpkin cake variations on the blog (cinnamon maple pumpkin cake, butterscotch pumpkin cake). Thanks to the powers of pumpkin puree, this cake is super moist. To pumpkin-hating friends: this tastes NOTHING like pumpkin pie. The coconut oil in the batter really helps to round out and balance the cake. Coconut oil further helps to moisten the cake, but it also lends this subtle richness and tropical-ness that makes this cake so addicting. The addition of chopped dark chocolate in between the chocolate caramel cream cheese frosting helps to make this cake taste SO AWESOME. I found these super cute animal friends at Hobby Lobby while shopping for holiday decor. It was an impulse buy that turned out to be quite useful. You can find the exact same set online through Amazon. To add crunch and texture (but mainly to mimic dirt), I added roughly chopped chocolate and chopped pistachios. 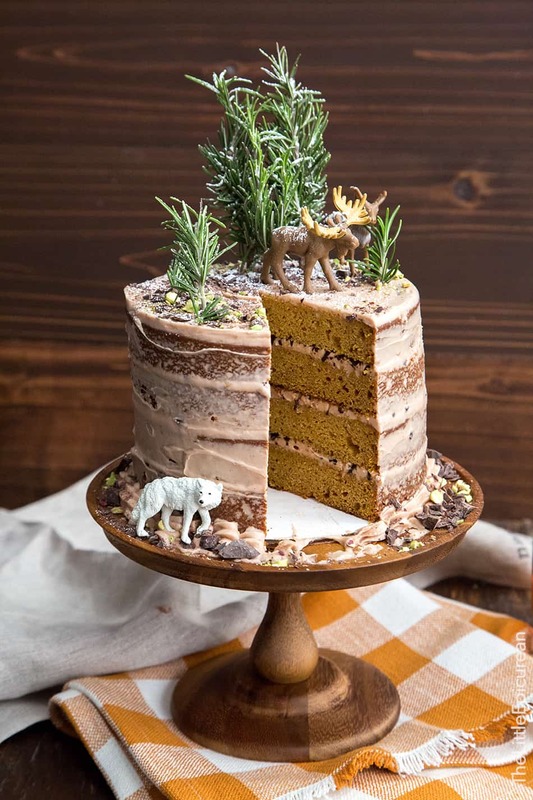 I had so much fun making this cake that I felt obligated to use two different backgrounds: my usual neutral backdrop and this woodsy, cabin, lumberjack setting. I feel like I should have worn my red flannel button-down shirt and took a photo of myself holding the cake. Perhaps next time I’ll use a small saw knife or a mini axe to slice the cake! I’ll definitely be making more scene cakes like this. 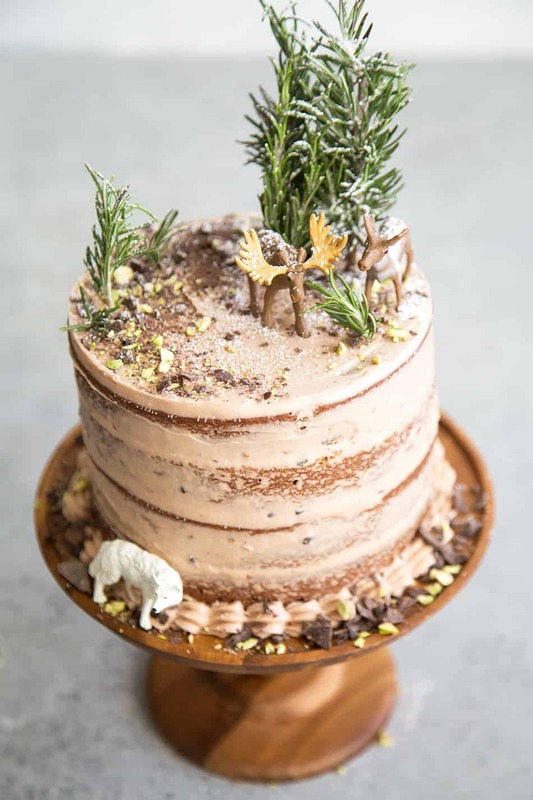 Maybe an underwater adventure cake or a vegetable garden with rabbits and friends or a desert scene! I’m getting too excited and way ahead of myself. Preheat oven to 350 degrees F. Butter two 6-inch round cake pans and line with parchment paper. Set aside. Add half of dry flour mixture. Mix on low speed until almost combined. Add milk. Mix on slow speed and then add remaining dry flour mixture. Mix until there are no longer any dry streaks of flour. Scrape down bowl as needed to ensure thorough mixing. Divide cake batter between the two prepared cake pans. Level batter using a mini offset spatula. Bake for 35-40 minutes until toothpick inserted in center of cake comes out clean. Allow to cool in pan for 5 minutes before unmolding. Allow cakes to cool to room temperature on wire rack. Using a hand mixer (or stand mixer), beat cream cheese until smooth. Add butter and continue to beat until mixture is smooth. Scrape down bowl as needed. Sift together powdered sugar and cocoa powder. Add to mixing bowl and combine together at low speed. Add caramel and pinch of salt. Mix until frosting is smooth. 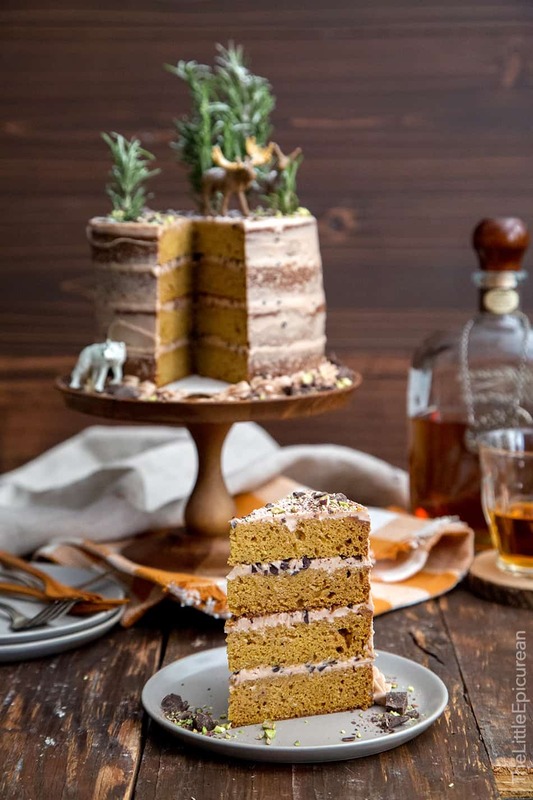 Slice each cooled pumpkin cake into two layers. Place one cake round on cake board (or serving plate). Spread a layer of frosting over cake layer. Sprinkle a handful of chopped dark chocolate over frosting. Place second cake layer on top. Gently press cake layer down to secure. Spread a layer of frosting and add another layer of chopped chocolate. Continue to repeat until fourth cake layer of added on top. 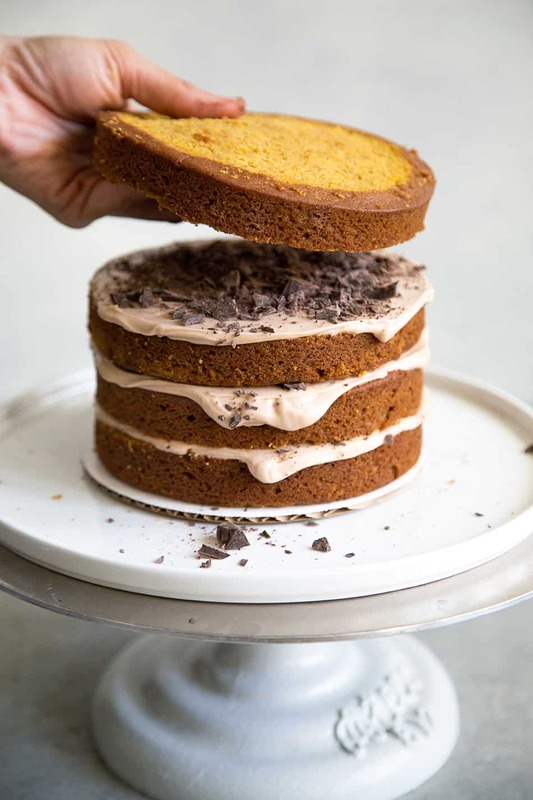 Spread frosting all over cake to seal in the crumbs (crumb coat). Let chill in the refrigerator for at least 15 minutes. If desired, add another layer of buttercream to coat cake. If desired, pipe border along the bottom of the cake. Otherwise, continue to chill cake until ready to serve. Decorate cake before serving. 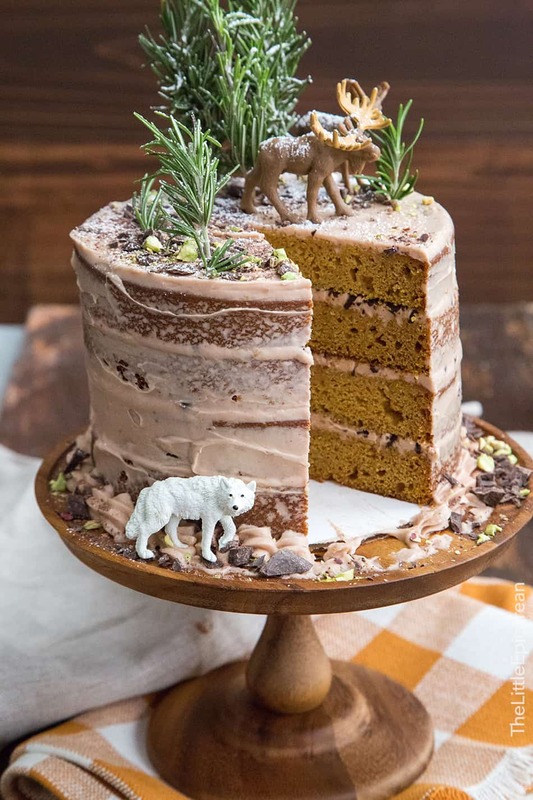 Use fresh rosemary sprigs, chopped pistachios, and chopped chocolate to garnish the top of cake. Add additional chopped pistachios and chopped chocolate along the bottom of the cake. 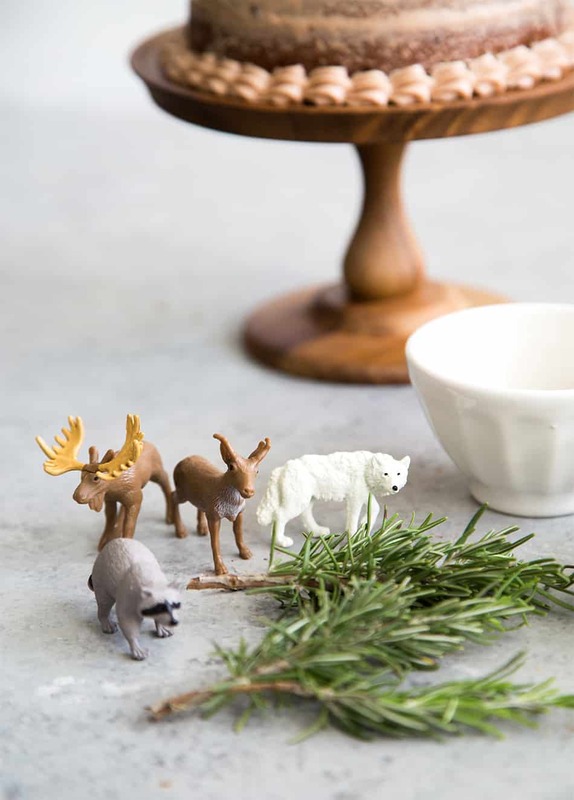 Place animal toy figurines, if desired. As a final touch, dust cake with powdered sugar to resemble snow. Thank you! My thoughts exactly…it’s time for another party! Congrats on your one month anniversary! And, go my goodness, this cake is SO gorgeous! This is an absolutely stunning cake! This is one of the most amazing cakes I’ve ever seen! I can’t stop looking at it! Wow, I would love to make something like this for the holidays. It looks superb. Here to one month’s anniversary (and more by now…)! 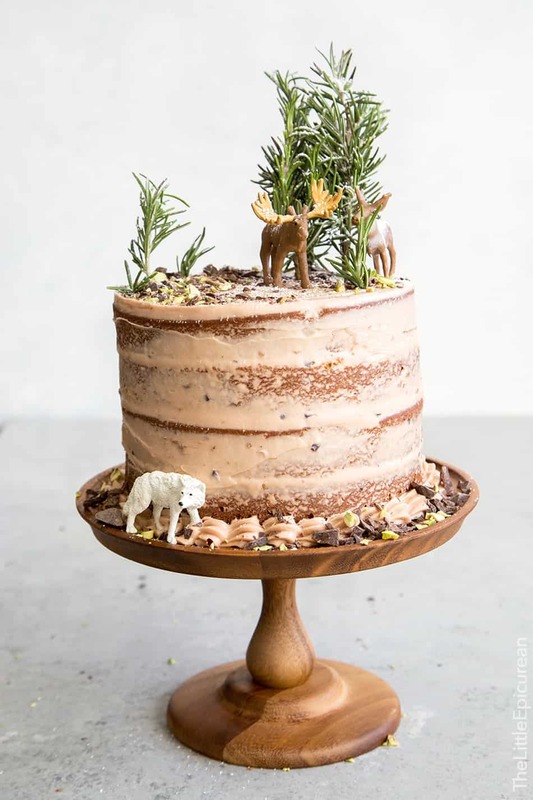 This is such a super cute cake which I can’t wait to try. I love the animals and how it’s wonderfully decorated which I know my boys will love.